In this blog we're going to create a super simple UI5 application that uses the news api to pull in our data and then display that data using the generic tile control. News API is simply an easy to use API for developers to request news data from all over the world and with a number of filters built in such as country and category. Head on over to https://newsapi.org/ and sign-up for an account, this takes almost no time as you'll need the API key. Create a new UI5 application through your chosen method, I personally use ExpressUI5 to make applications like this. Disclaimer I made this small node package and have a blog on how to use it here. But if you're new to UI5 I'd suggest the use of WebIDE as it's super easy for beginners and they have a template for simple applications just like this. So news.js has a single function which simply hooks into the news API and returns to us articles with the country code of GB and category of business. Make sure to replace 'YOURAPIKEY' with your actual API key provided from the newsapi.org website. We import our news.js file at the top of the UI5 controller and then simply call our getNews function. Then on return of our promise call our setArticlesModel function which will create our UI5 model that we need to bind out data to the generic tile. Don't worry if your background image isn't filled in/ is blank as not all of the news stories coming from the API will have that and this is just an example application. One thing that I learned a while ago using UI5 is that not all standard controls have aggregations to bind multiple items, I could have used a different control for this blog post but I wanted to show off this little trick that I learned a while ago which is to use the Grid control. <mvc:View controllerName="nathan.hand.news.api.controller.mainView" xmlns:l="sap.ui.layout" xmlns:html="http://www.w3.org/1999/xhtml" xmlns:mvc="sap.ui.core.mvc"
Inside of the Grid control we can specify our content aggregation and bind that to our JSON model which means our generic tile will be repeated with each element in our JSON model and we can drop the '0' found in our previous example. 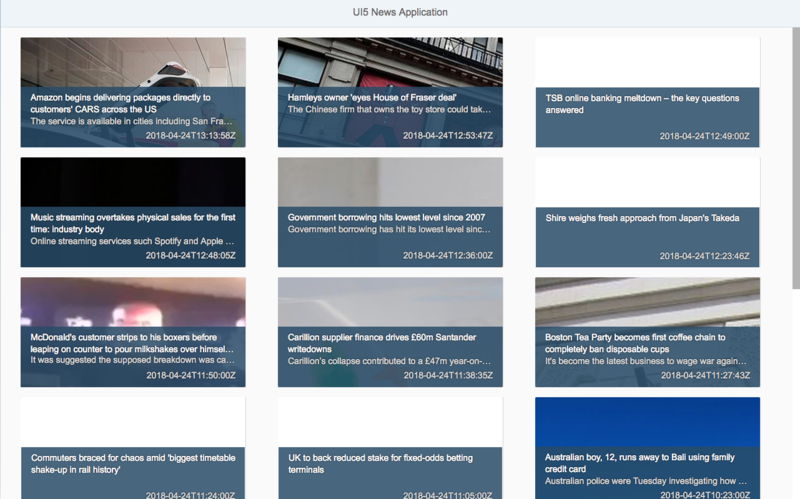 We've managed to create a super simple news application using UI5 and the newsapi.org API. There's lots to clean up here such as implementing our press event and formatting the article date but I hope this has been a useful base on getting up and running using an external API and UI5 together. Questions? Comments and general feedback? Leave them down below or reach out to me on Twitter.